During early evenings every September, the constellation Lyra occupies a position almost directly overhead, ideal positioning for skywatchers to view its delicious showpiece, the Ring Nebula (inset). In a backyard telescope, this stellar corpse resembles a tiny smoke ring. The constellation's very bright star Vega makes it easy for skywatchers to find Lyra. An astronomical breakfast awaits if you look straight up in the sky in the upcoming nights. This time of year, the constellation Lyra occupies a prime location at the apex of the early evening sky. Astronomers know that the best time to view an object is when it is directly overhead, when it shines through the thinnest possible layer of Earth's distorting atmosphere. So, right now is a great time to view the treats — a "double double" and a donut — in Lyra's "coffee shop"! Lyra is an easy constellation for skywatchers to find using the naked eye, and it contains celestial treats visible in binoculars and backyard telescopes. In this edition of Mobile Astronomy, we'll tell you how to use your favorite sky-charting app to enjoy this constellation. Once it's dark, tilt your head back — or set out a blanket, gravity chair or chaise — and look waaay up. The point in the sky directly above you is called the zenith. During the night, various stars and constellations will pass through that patch of sky as the Earth's rotation carries them from east to west. While objects occupy that position, they will always appear at their best. So, objects in the zenith appear clearer, because starlight arriving to our eyes (or telescopes) from the zenith passes through the least amount of atmosphere. Starlight from objects lower in the sky passes through much more air. For example, light from stars sitting about 30 degrees above the horizon is traversing twice as much air as those at the zenith, and light from objects near the horizon is being viewed through as much as six times the air mass. That's why professional and amateur astronomers use planetarium software to determine the dates and times when their viewing targets are highest in the night sky. It's also why our views of Saturn have been less than ideal for the past couple of years. The ringed planet has been appearing during the summer months, when the plane where we find all the planets, called the ecliptic, is very low in the nighttime southern sky. Saturn's orbit around the sun takes 29.4 years, so we will have to wait a while longer before the planet moves into a higher position in the autumn sky. In early evening in mid-September every year, the constellation of Lyra the Harp passes near the zenith. Let's tour this constellation, pointing out some objects you can see with binoculars and small telescopes. Your favorite sky-charting app — such as SkySafari 5 for iOS and Android, Star Walk 2 and Stellarium Mobile — can help you find Lyra's "donut" and its "double-double" (coffee)! In Greek mythology, Lyra represented the harp played by Orpheus. Visible from spring to autumn in the Northern Hemisphere, this constellation is flanked by Hercules on the west, Draco on the north, Cygnus on the East and Vulpecula on the south. The Milky Way passes nearby, enriching Lyra's star fields. In Greek mythology, Lyra was the musical instrument created from a turtle shell by Hermes and later used by Orpheus in his ill-fated attempt to rescue his lost love Eurydice from the underworld. The constellation is one of the original 48 listed by Greek astronomer Claudius Ptolemy, who lived during the second century. It is bounded by the much larger constellations of Hercules on the west, Cygnus on the east and Draco to the north. For skywatchers in the Northern Hemisphere, Lyra is visible from spring through autumn. Once it gets dark, at about 8:30 p.m. local time, face south and look just to the lower right of the zenith. Your eye will be drawn to the very bright star Vega, also known as Alpha Lyrae, the brightest star in Lyra. Vega is the fifth brightest star in the entire night sky, partly because it is only about 25 light-years away and partly because it is a very hot, luminous star. The name Vega was adapted from the Arabic "al Nasr al WakI," or the "Swooping Eagle." Traditionally, the Lyre was pictured as being grasped in the talons of an eagle. The north end of the Earth's axis of rotation points to a location in the sky called the north celestial pole (NCP). Just as a spinning top's axis slowly processes, the NCP moves in a circle through the stars, taking millennia to complete each circuit. At present, the star Polaris sits close to the pole, but in the distant past, Vega (at bottom) was the most prominent polar star, as it will be again in about A.D. 13,700. Vega also is the brightest, highest and most westerly of the three beautiful, blue-white stars of the Summer Triangle. Moving clockwise, Altair is about three fist widths below and to the left of Vega. Deneb, slightly dimmer than the other two, completes the large triangle at the upper left. The separation between Deneb and Vega is shorter, only 24 degrees or 2.5 fist widths. Chinese culture celebrates a love story in which the cowherd Niú Láng (牛郎) is the star Altair. In the legend, he and his two children, represented by Beta and Gamma Aquilae, the stars that flank Altair, were separated from the children's mother, Zhī Nǚ (織女) the "Weaving Girl" (Vega), by a river, which is represented by the Milky Way. Each year, on the seventh day of the seventh month of the Chinese lunisolar calendar, magpies are said to make a bridge so that the family can be together again for a single night. Look for a medium-dim star about a finger's width to the left of Vega and a similarly dim star about a finger's width below Vega. The three stars form a neat little triangle, with Vega at the right vertex. Lyra contains a number of double stars that are visible in binoculars and backyard telescopes, including Epsilon Lyrae (nicknamed the Double Double), Delta Lyrae and Zeta Lyrae (also called al Nasr al Waki). Deep-sky objects include the Ring Nebula (labeled here as M57); the globular star cluster Messier 56 at lower left; and two open clusters, NGC 6791 and 6743. The other corner of our little triangle is the star Zeta Lyrae, and it, too, splits into a double star when viewed with binoculars. Both of those stars are white, and one is slightly brighter than its partner. These stars are about 152 light-years away from Earth, and they themselves have partners that are too close to split visually. Some apps label Zeta as Nasr Alwaki. Zeta is the top right star of a narrow, upright parallelogram — about two fingers wide and four fingers tall — that forms the rest of the constellation. Moving clockwise through the corners, the three other stars are Sheliak, Sulafat and Delta Lyrae. Sheliak, meaning "Harp," is the brightest member of a tight little grouping of stars visible in a telescope. Sheliak itself has a close-in dim partner that orbits the main star; every 13 days, the brighter star is blocked and the total brightness drops by a noticeable amount. This is called an eclipsing binary system. At the bottom left corner of the parallelogram sits Sulafat, which means "Turtle" — the star is named for the shell forming the body of the Lyre. Sulafat is a hot, blue, giant star located 620 light-years away from Earth. Similar in color to Vega, Sulafat is much larger; it is an old star on its way to becoming an orange giant many years from now. Finally, at the upper left of the parallelogram is Delta Lyrae. Sharp eyes and binoculars will easily show that this is yet another pair of stars, one blue (upper) and one red (lower). The two stars are not related; the blue one is several hundred light-years farther away than the red one. They just happen to appear close together along the same line of sight. 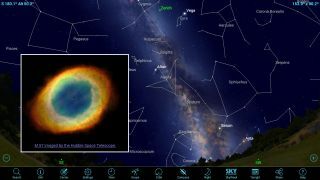 Selecting an object and tapping Info in the SkySafari 5 app brings up a page containing alternative names for that object, its sky location, its distance, and details about the object's discovery and astrophysical characteristics. The Galaxy icon at lower right presents the object's location within the Milky Way. So, where's the donut? Train your telescope midway between Sheliak and Sulafat, and look for the little, dim, gray circle known as the Ring Nebula (also known as Messier 57). This little bubble of gas in space, which resembles a smoke ring when viewed in a backyard telescope, is the remnant of a dead star that was very much like our sun. When a small star exhausts the fuel in its core, it undergoes a gravitational collapse and rebound that expels the star's outer layers, leaving the blazing-hot core exposed as a white dwarf star. The expanding stellar material is made to shine by the radiation emitted from the white dwarf. There's one more deep-sky treat in Lyra. Using binoculars or a telescope under a dark sky, scan toward the lower left along the imaginary line connecting Sheliak to Sulafat. At about twice their separation (from Sulafat) sits a globular star cluster called Messier 56. It will appear as a dim fuzzy patch — a donut hole! Globular clusters are spherical-shaped old concentrations of stars that orbit just outside our galaxy. Messier 56 is not a particularly bright one. For an easier globular cluster, search for Messier 13 in your app. It's not too far away. The Kepler space telescope stared at the same region of sky near Lyra for several years, detecting the slight dimming of stars' light that occurred when the exoplanets that orbit them transited the stars. To date, about 2,500 confirmed exoplanets have been discovered in that patch of sky alone, and 30 of those are believed to be Earth-size and within their stars' habitable zones. Lyra sits just beside the rich star fields of the Milky Way, so it's an area of sky that rewards scanning with binoculars and backyard telescopes. Professional astronomers have studied this region of sky, too. To find exoplanets, the Kepler space telescope mission stared at an area a bit larger than a clenched fist (115 square degrees) located just to the upper left of Lyra. The telescope was looking for the slight dimming of starlight produced when planets cross in front of their host stars. To date, about 2,500 confirmed exoplanets have been discovered in that patch of sky alone, and 30 of those are believed to be Earth-size and in their stars' habitable zones! In a future edition of Mobile Astronomy, we'll talk about how distances to stars are measured, cover wireless telescope remote control and look into more topics. In the meantime, keep looking up! Editor's note: Chris Vaughan is an astronomy public-outreach and education specialist at AstroGeo, a member of the Royal Astronomical Society of Canada, and an operator of the historic 74-inch (1.88 meters) David Dunlap Observatory telescope. You can reach him via email, and follow him on Twitter @astrogeoguy, as well as on Facebook and Tumblr.